Without marketing, no one will know your private practice exists. Kevin Costner steered you wrong if you think “If you build it he will come” applies to your private practice and your ideal client. But, to many therapists, the word marketing itself conjures up thoughts of pushy salesmen and sleaze. So they avoid talking about their private practice and leave their business up to chance. Like any successful business, having a marketing strategy for your private practice is paramount to your success. Because you do your clients a disservice when you don’t do the work to reach them with the services they need to create the change in their life that they desire. But the good news is that you can get started marketing your private practice today so that you can begin attracting more clients asap. How to get started marketing your private practice, so that you can begin growing your case load even if you're short on funds and just starting out. Pro strategies for building your online presence so that you can start attracting your ideal client to you and your practice. What you need to know about creating a website so that you can stand out from the crowd and communicate your value effectively. How to write blog posts that expand your reach, showcase your expertise and speak to your ideal client so you can convert more website visitors into paying clients. Social media marketing strategies therapists can use to get more clients and get more clients visiting their website. SEO tips to help you optimize your content so that more clients can find you in search engines. Advice for getting more referrals to your private practice so you don't have to worry about never having enough clients calling you. 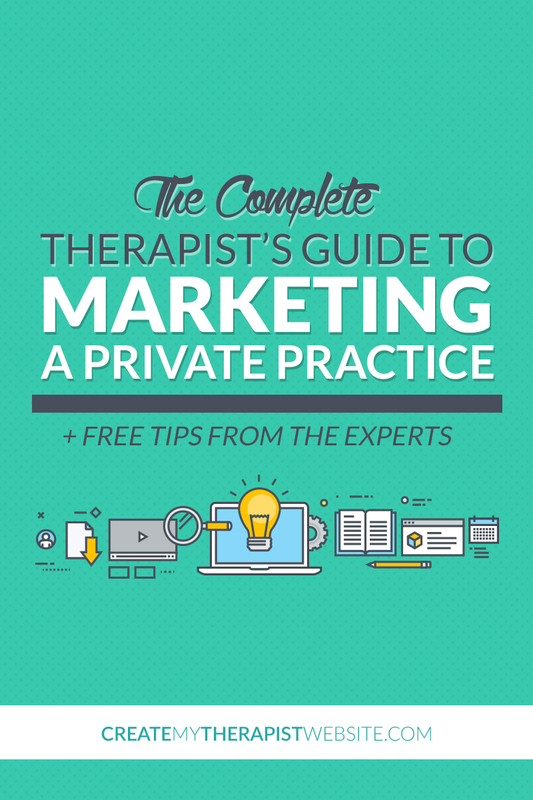 Whether you're just starting out or your private practice is established, this guide will give you tips, resources and advice on how to market your private practice and get more clients. I collected marketing advice from some of the top experts in private practice marketing into one FREE info-packed resource. If you’re new to private practice it can be hard to know where to begin with your marketing efforts. Here you’ll learn how to get started with a marketing plan to give yourself direction, some mistakes to avoid, how write an effective directory profile and some free marketing strategies you can use when your budget is low. Having a professional website for your private practice is absolutely essential. Your website is often THE place potential clients will go to learn about you and see if your therapy services can help them. It’s also the best way to begin building rapport and connection with your clients while also sharing your expertise. Below, you’ll learn some tips on building your own private practice website, the costs involved, guidance on writing copy plus more info to get you started. Want to see more traffic hit your private practice website? Start blogging. Blogging remains one the best ways to boost your traffic, reach your ideal client and showcase your expertise as a therapist. Get started with your blog or take your current private practice blog to a new level with the resources below. What’s the point of having a website for your therapy practice if no one can find you? Search engine optimization (SEO) remains an important part of marketing a private practice, but can be confusing, time-consuming and frustrating. Below you’ll find resources to simplify SEO for your private practice and help you understand what’s important to know when trying to increase the rank of your private practice website. Social media can be a great way to reach your ideal client with content they are interested in. Using social media to share the content you create (ie blog posts), as well as helpful content your clients find interesting, can help you attract more clients to your private practice. Use the links below to learn how to use social media to build your private practice. Networking and building your referral sources can seem a bit old school, but the truth is, it works. When it comes to building a private practice (or any business) there’s just nothing faster than human connection. If you have a solid network of colleagues, clients and other people in your community sending you clients, then marketing gets a whole lot easier. Below you’ll learn the ins and outs of growing your private practice with referrals to make getting clients a breeze. I've compiled all their marketing wisdom into an info-packed PDF - free as my gift to you! Hello There! I'm Daniel. I'm a web designer and founder of CreateMyTherapistWebsite.com, where I teach therapists how to create websites and attract more clients online. After building a website for my wife’s private practice and seeing the impact it had on her business, I became crazy passionate about helping others achieve the same. So now, I offer web design services, consultations and online training to help therapists overcome tech-fears and grow their business through online marketing.